BMS Pest Control offers a fast, effective and professional service at affordable prices to rid your home or business of bedbugs. Our treatments are safe, clean and are carried out at a time that is convenient to you. We will be happy to answer any questions you may have and to offer help and advice. Please remove all bedding from the affected beds and wash thoroughly on as high a temperature as possible (above 50℃). Please also remove any items from drawers under beds and from bedside cabinets/furniture. If there is a wardrobe next to the bed, please remove all items from this too. Please vacuum the area around the bed, paying particular attention to the junction between the walls and floors and the gap under skirting boards. We will treat mattresses, bedframes (including the inside and drawers), headboards, bedside furniture and the walls and floor around the bed with a residual insecticide. Unlike ‘DIY’ aerosol sprays, a residual insecticide will continue to kill bedbugs even after the treated surfaces are dry. Any electrical appliances near the bed that show signs of infestation will be treated with a residual insecticide powder. We do not spray clothing or bedding. We ask that customers vacate the premises during treatment and not return until treated surfaces are dry. Once dry, it is 100% safe for the occupants to return, including children and animals. Bedbugs are associated with human habitation. They hide in furniture and structural cracks and crevices. They emerge at night when hungry to search for blood meals and can ingest up to seven times their own body weight during a meal. Bedbugs are not known to be serious carriers of disease but they do cause unpleasant irritation following their bite. In rare cases the bites can cause a serious allergic reaction. Where there is a heavy infestation of bedbugs there is a distinctive odour. 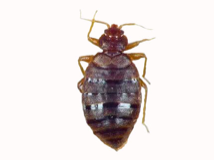 Lodging houses, hostels and hotels are a particular risk as bedbugs can be carried on luggage. Second hand furniture is also another source of infestation.